A disabled man in Can Tho Province has been honoured at the annual Kova Prize for his efforts in mending local roads. The Kova Prize was set up by former Vice State President Nguyen Thi Binh and Chairman of Kova Paint Group Nguyen Thi Hoe in 2002. It is held annually to honour individuals and groups who have made significant contributions in the fields of science, education, charities, and other areas. This year, 51-year-old Nguyen Hong Dan was honoured in the category of Beautiful Living. Dan said he was informed about the awards 10 days ago. Both Dan and his wife were surprised and happy when receiving the news. 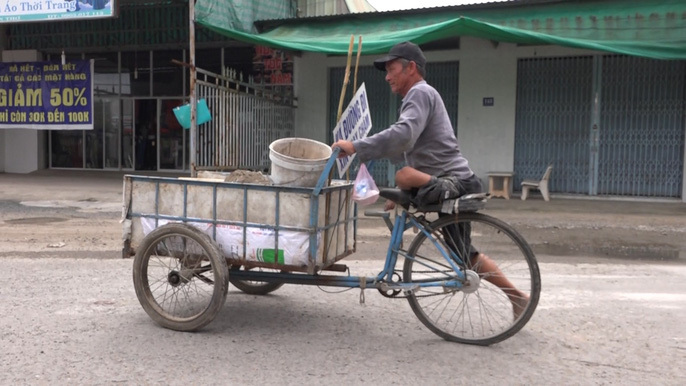 51-year-old Nguyen Hong Dan rides a cart to carry cement and gravel for mending roads. "We're not concerned about us being recognised personally, its more about the fact that our efforts have been noticed. I mend the roads to make it safer and more convenient for everyone. I do not wish for anything," he said. Dan also revealed that the award may worth VND20m (USD862). He will give his wife the money to expand their business as a small trader so that he can focus on mending the roads. Four years ago, Dan's children went to Binh Duong Province to find jobs at factories. Both Dan and his wife also came to Binh Duong along with their children. While travelling and selling lotto tickets for a living, Dan realised that there were many potholes on the roads which led to various accidents. He decided to stop and find rocks and soil on the sides of the roads to fill the first potholes since then, he has continued to mending the roads non-stop. When his family moved to Rach Gia City in Kien Giang Province, he kept on selling lotto tickets and filling the potholes despite the disabled leg. He even bought a cart to carry cement and gravel along with him. One and a half year ago, Dan and his wife returned to Binh Thuy District, Can Tho City and rented a small apartment for VND600,000 a month. Dan still takes notice of the potholes while selling lotto tickets and he always returned on the next day to mend the streets. Nguyen Hong Dan and his wife. He uses his own money for the mending. While some people think that he is wasting his health doing unthankful tasks, other people also helped him with the mending or regulating the traffic. Ngo Thi Phuong, Dan's wife, said, "At first, my parents didn't want him as their son-in-law because he is disabled. But his kindness won them over." "I feel happy whenever I mend the roads. I just hope that I'll stay healthy to continue the work," Ba said. The 16th Kova Prize will be held in Hanoi on November 24./.